I, myself, also like to travel and often go overseas. I often go to the same area. But when I get used to the journey, I become to think that I want to go somewhere different from other people. For me, it is Australia. As I live in mountains, I love to travel to the seas and somewhere warm. I often go to areas around Cairns airport, which are famous of Great Barrier Reef, and has a good access from Japan. At first, I went to areas, where many Japanese tourist visit and are often listed on Japanese guide books. I felt them secure. After visiting a couple of times, I became to visit areas where Japanese rarely visit. That gave me a lot more satisfaction for the travel. I think that travel lovers, who are reading this blog, also can understand my feeling about this. 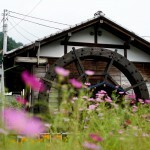 I strongly recommend you to collect various information and challenge a trip to rural onsen. Fortunately, we can find lots of information by researching on websites. ★ 1. There are deep Japanese cultures. At first, there are deep Japanese cultures. The cultures are not so exaggerate, but simple sceneries, such as building architectures, people living there, onsen town’s atmosphere, shops, which have been left at the area. By those, we can remind original sceneries of Japanese town, even Japanese people are forgetting. And each town has unique points. Cities and big onsen towns have somehow unified style of buildings, shops, and atmosphere. So travelers, who “knows Japan very well,” might feel that there is less interest. ★ 2. They are surrounded by beautiful nature. 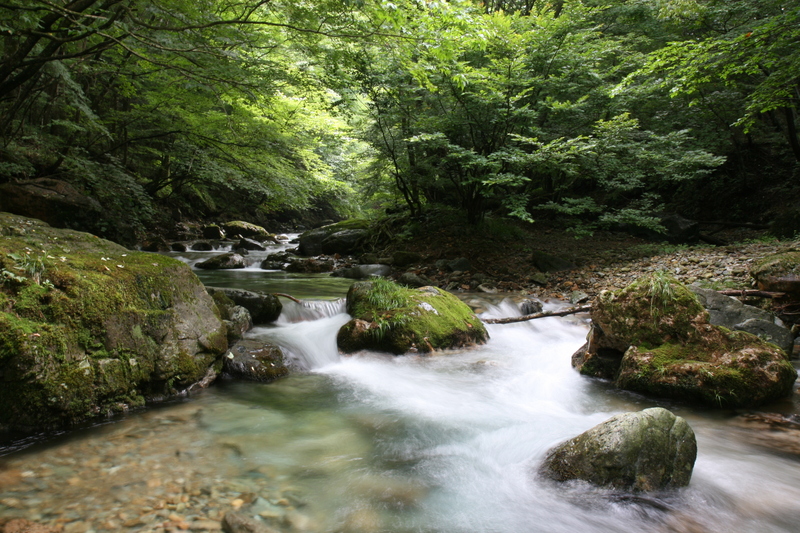 In addition, most of rural onsen are surrounded by beautiful nature. 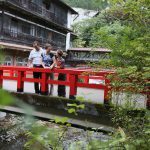 Shima onsen, where our Kashiwaya ryokan locates, are proud of Okushima lake, which has special blue, called “Shima Blue,” Shima river, and many falls. Woods and mountains also show various expressions of new greens, autumn leaves, and snow seasons. Water activities, such as canyoning and canoeing, walking, and cycling with free bicycles are also very pleasant and recommended. Also other rural onsen have unique wonderful nature, such as seaside sunset is beautiful, autumn leaves are famous, and you can enjoy open-air onsen with snow. 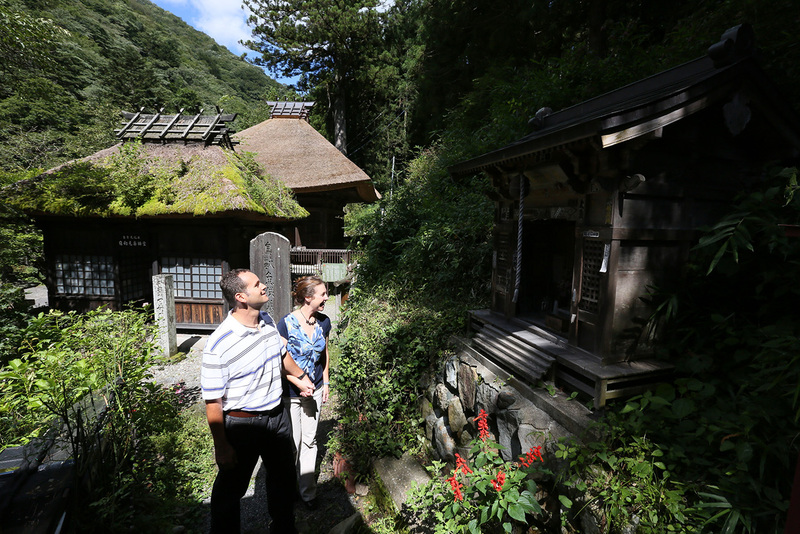 One another reason to recommend rural onsen is, although you might be surprised, that they are less crowded and quiet. Many people travel various tourist spots and cities, thinking “As I came to Japan so far, I want to travel many places!” Tokyo, Kyoto, Mt. Fuji, Tokyo Disneyland, Osaka… Many of them are crowded with lots of people. Then, you should move to Shima onsen and check in. Many customers say that you can really relax in a time flow totally different from other sightseeing area and in quiet and slow atmosphere. From these reasons, if you are planning second time or third time Japan travel, we strongly recommend you include a plan to rural (countryside) onsen, which are rarely listed on travel guidebooks. First, our Shima onsen. Only about 3 hours trip from Tokyo. In addition, if you are based in Tokyo, I recommend Gunma-ken, where Shima onsen locates, Tochigi-ken, Nagano-ken, and Niigata-ken. There are many minor onsen at these prefectures. Also, although these prefectures are local, there are Shinkansen so the access is not so bad. 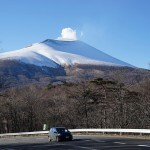 To become “Japanese freak,” please visit rural onsen, starting from Shima onsen. We are really looking forward to welcoming you. One of the reasons why people in Japan just love onsen is because of it’s very close lotion to nature. Immersing yourself in local onsen cleanses the mind, body, and soul, an experience that a lot of travelers and tourists should experience when they visit Japan. Local onsens are also very relaxing and very pleasant to be in. Thanks for a great post on local onsens in Japan!